The Australian Society of Viticulture and Oenology (ASVO) last night announced its Awards for Excellence winners for 2018. 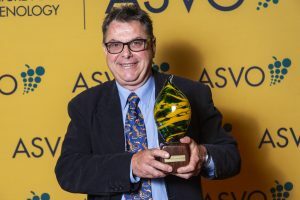 Pete Bissell, of Balnaves, a family-owned winery in the Coonawarra, was named ASVO Winemaker of the Year. Bissell is a foundation member of the Limestone Coast Wine show, Chair of the Limestone Coast Grape and Wine Council, and a member of the Limestone Coast Technical Committee, which coordinates the delivery of research and extension activities in the region. He is the lead author of the Red Winemaking chapter of ‘Australian Winemaking’ and has worked closely with many wine industry groups and stakeholders to present various regional wine industry concerns on fracking to the SA Parliamentary enquiry into Unconventional Gas in the Limestone Coast in 2016. Since graduating from Roseworthy and gaining first-class honours from the University of Canterbury, Bissell has made wines for several companies and has gained international experience including time spent in Bordeaux, the South of France and Moldova. He has completed 38 vintages including the last 30 in Coonawarra, has been a wine show judge since 2000 and has judged at numerous wine shows across Australia. “Pete has been a keen innovator both in the winery and the vineyard and is eager to share his knowledge. He has also been involved with the development and commercialisation of berry sorting equipment that provides considerable cost advantages. 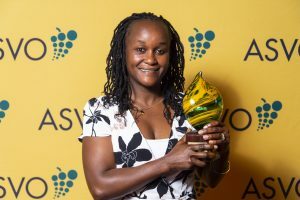 These qualities encapsulate the ASVO Winemaker of the Year Award,” said Wendy Cameron, chair of the award selection committee. 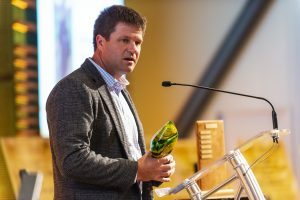 The ASVO Viticulturist of the Year award was awarded to Colin Bell, viticulturist and director of AHA Viticulture, a viticultural consultancy based in Western Australia. With a background in horticulture, the waves of the Margaret River region drew Bell to the industry in the late 1990s. His working life consists of managing vineyards and consulting to wineries and growers. Free time sees him serving as a board member for Wines of West Australia and as an independent board member of Australian Vignerons, the peak body for Australian winegrape growers. Bell is a graduate of Charles Sturt University and the wine industry’s Future Leaders course, and his experience spans to New Zealand, Tasmania and South-East Australia. As a viticulturist, Bell loves to challenge practices and use innovation to improve performance and generate profitable businesses. 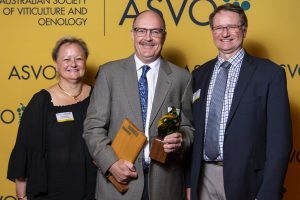 ASVO Award recipients are nominated by ASVO-appointed selection committees, comprising individuals who themselves are distinguished in the fields of viticulture and oenology and who demonstrate exceptional leadership ability and vision. The ASVO Awards also saw the presentation of Oenology and Viticulture Papers of the Year from the ASVO’s peer-reviewed Australian Journal of Grape & Wine Research and the inaugural Dr Peter May Award for most cited paper from the AJGWR over the last five years. Dr Robert Bramley, CSIRO Agriculture & Food, accepted the Dr Peter May Award. The award was introduced for the first time this year to honour the late Dr Peter May who was the foundational editor of the AJGWR. 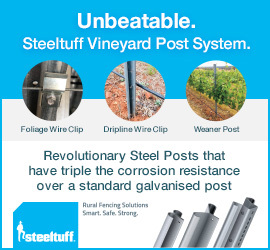 The paper, ‘Within vineyard variation in the ‘pepper’ compound rotundone is spatially structured and related to variation in the land underlying the vineyard’, reports the results of investigation initiated by the late Nathan Scarlett who was the national technical viticulturist with the Rathbone Wine Group (and an ASVO Viticulturist of the Year finalist in 2014). The viticulture paper of the year was awarded to Dr. Catherine Clarke, at Agriculture Victoria, for the paper ‘Effectiveness of sodium hypochlorite as a disinfestation treatment against genetically diverse strains of grape phylloxera Daktulosphaira vitifoliae Fitch (Hemiptera: Phylloxeridae)’. “The findings in this paper have great implications for the national interests of biosecurity and on the National Phylloxera protocols. The outcomes have significant input into best practice and quarantine standards being upgraded to reflect the recommendations of the paper”, said the selection committee. The winemaking paper of the year was awarded to Dr Paul Boss, from CSIRO Agriculture & Food, for ‘Fermentation of grapes throughout development identifies stages critical to the development of wine volatile composition’. Dr Boss’s paper was selected by the committee because it brings into question current beliefs regarding grape flavour development and picking times through detailed chemical analysis of Cabernet Sauvignon and Riesling over the course of berry development. 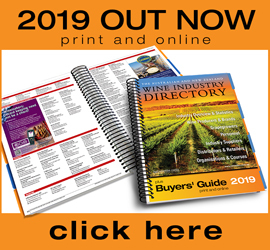 This information has a direct application for winemakers who can tailor their wine style from the vineyard, the committee noted. The ASVO has provided promotional access to all three papers from the AJGWR which can be read free online until the end of the 2019. 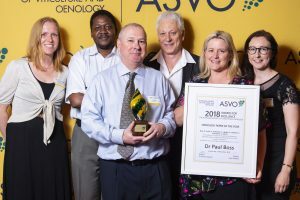 The ASVO also named two of its members as Fellows – an honorary membership category that recognises the exemplary contributions by members of the Society, and to the discipline and/or profession of viticulture and/or oenology. This years Fellows were Dr Richard Smart and Dr Robert Dambergs. ASVO 2018 Fellow Dr Richard Smart had his award accepted on his behalf by former colleagues Patrick Iland and Peter Dry. Photo: John Krüger. 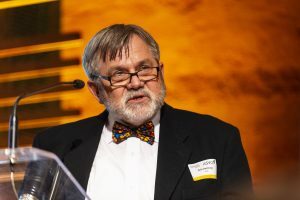 “Selection was particularly difficult this year because of the extremely high calibre of candidates being considered for ASVO Fellows,” said ASVO president Dr Tony Robinson. “The collective wisdom that both these people exhibit is extraordinary, matched only by the diversity of their background and experience. “There are few people that have contributed more to the world of viticultural science than Dr Richard Smart. Richard has been a great advocate for the Australian wine industry and there is no doubt that Richard has had an outstanding career in education, research and service to the Australian wine industry. 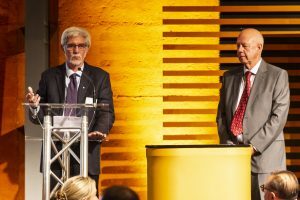 On being advised of his award as Fellow, Dr Smart said, “I have spent the last eight or so years living outside Australia and have been somewhat out of sight. This makes the recognition of my career all the more significant to me, it is nice to be recognised at home, and where I began my profession and received the earliest training and mentorship. I am very grateful to the ASVO for this honour”. Bob joined the ASVO soon after his own entry into the wine industry and has been a member since. 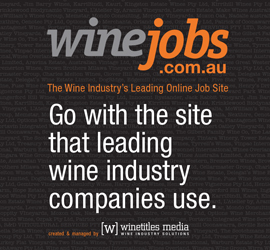 “The year I started in the wine industry and the first thing I did was go to an ASVO seminar, “ said Dambergs. 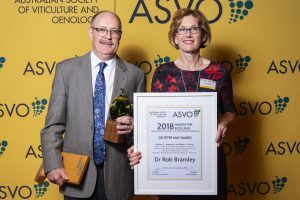 Bob was recognised for his breadth of industry and research skills, both in oenology and viticulture, his Society and other broader industry contributions, and as a pioneer of spectroscopy research in the Australian industry. The award also acknowledged his numerous mentoring roles contributing to the next generation through “selfless sharing of his knowledge with others, an endearing characteristic of a Fellow of the Society”.